PMP is a school programme for year one and two children. They are introduced to skills needed for formal learning in reading, writing and maths. All these skills start to develop from birth and continue through life. There is a point where children need to have skills if they are to cope in specific subject areas. Children attend PMP three times each week for 30 minute sessions. 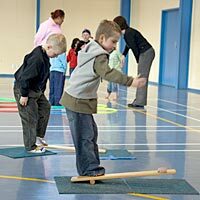 Two sessions are equipment sessions and one is a floor session where new skills are taught. 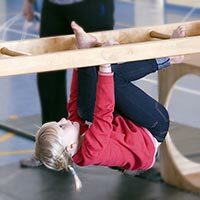 Every equipment session includes fitness, locomotion, eye/hand or eye/foot coordination, balance and eye tracking activities. Each activity is supervised by an adult helper. All children are actively involved at all times. Bowling – bowls, ten pin bowling, cricket. Throwing – cricket, t-ball, netball.